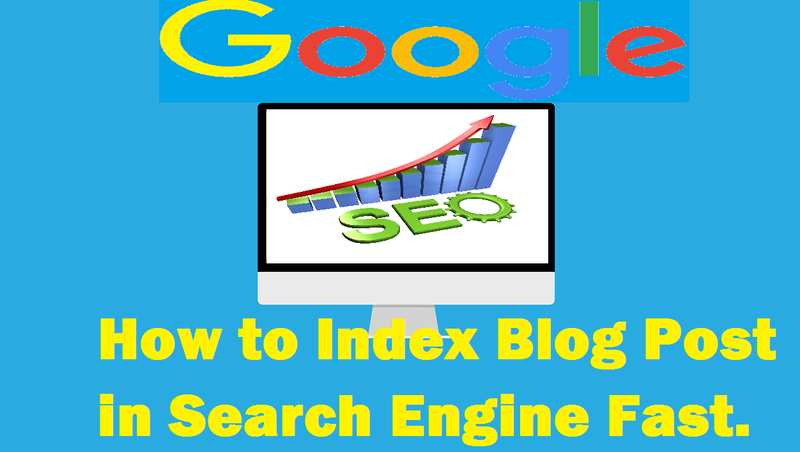 How to Index Blog Post in Search Engine Fast: Hello Friends In today's article, we are going to talk about the How to Index Blog Post in Search Engine Fast. So that when you publish a new article on your blog/website So they started showing in the Search Results as soon as possible and you started getting Traffic early on that article. When we create a blog, then we publish a lot of articles on that blog, in which some articles we also write on Trending Topics. Because Traffic is fast and more on Trending Tropics, so as long as our article does not show up on the Search Engine we do not even get traffic on that article. So today we are giving you 8 tips that will not only show you quick results on your article Search Engine but will also increase the chances of their arrival at First Page, so let's see if any article is posted in How to Index Blog Post in Search Engine Fast What you need to pay attention. 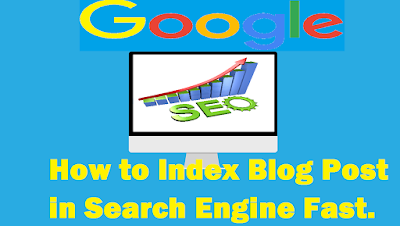 Regular updating on Blog is very important for you to submit Blog Post in Search Engine if you upload content regularly to your blog, then you can fast index your latest articles. So you have to fix a time that you have to upload Daily Content or take a day or two of Gape so that your Blog Visitors will also know when you publish articles and Search Engine also notice your posts. It is very important to have quality content on Blog which is relevant to your blog Topic as well as useful for users so that when a user visits your article, please also spend some time on your blog because if you Readers leave your blog early, then Search Engines assumes that your content is not useful for users. When you publish an article on your blog, your article on a page must be following the terms and conditions of SEO, which means that you have to pay full attention to SEO on your article. For Example: Title, Headings, Image Optimization, Permalink, and Target Keyword. Because when your article is fully SEO optimized, Search Engine can easily read that article and also show your article at Top in Search Result. Through Webmaster Tools, we give the information of our article to Search Engine, from which Search Engine gets information about our articles, and it sends our bots to our website so that they understand our article and then show in Search Result Are there. Therefore, whenever you publish a new article on your blog, you must fetch it on Webmaster Tools. Just as you submit your articles on Webmaster Tools, you have to submit your latest articles directly to Google and Bing's Search Engine, from which you get a backlink from Search Engine, show your article quickly in Search Result. Having a chance is also possible. To do this, you also need to have an account on Google Webmaster Tools and Bing Webmaster Tools and then you can search on Google Submit URL to Google and Submit URL to Bing so that you can find a page where you can share the link to your article. Pinging is a facility through which you can send Invitations to visit Search Bots on your article. Doing so, Search Bots will quickly read your article and show it in Search Results. Now if you use WordPress, you can add Ping List to your blog so that when you submit a new article, Ping List Automatic only invites the Search Bots. And if you use Blogger, you have to ping your articles personally. You can ping your article by using lots of tools available to ping on the internet. Social Media Sites helps you to increase traffic on your latest articles, as well as Search Engine also sees how many articles have been shared on your social media sites. By which she gets an idea that how much engage people are getting on your article. Therefore, you can share your article on Social Media Sites as well, that will increase the traffic on your article also, and you will also get Backlinks, which shows your article on First Page in Search Results. Social Bookmarking Sites is the second best option to share articles because most Bookmarking Sites provide you Do Follow Backlinks so you can create an account at most Bookmarking Sites and share your latest articles there as much as possible on your articles. Get Traffic and Backlinks. Because Search Engine can only read Do Follow Backlinks so you have to do more to Do Do Backlinks for your latest articles. By using all these tips, your Blog Post can Fast Index in Search Engine so that it starts getting Traffic early from Search Results. If you have any more questions, then please tell us in the Comment Box and don't forget to follow my Google+ Account.